Today, the pair demonstrates growth waiting for the outcome of the vote in the British Parliament on Brexit. Theresa May calls on MPs to approve the treaty, arguing that the consequences could otherwise be catastrophic. In case of failure of the vote, the Prime Minister will have three working days to prepare an alternative version of the contract. The US currency continues to be under pressure from disagreements between the Donald Trump administration and the US Congress on the construction of the wall on the border with Mexico. One of the key events in the US today is the release of data on Producer Price Index (15:30 GMT+2). The indicator in monthly terms is expected to decrease to –0.1% in December from 0.1% a month earlier, and in annual terms it can remain unchanged at 2,5% in December. Moderate volatility is expected at the market during the publication period. 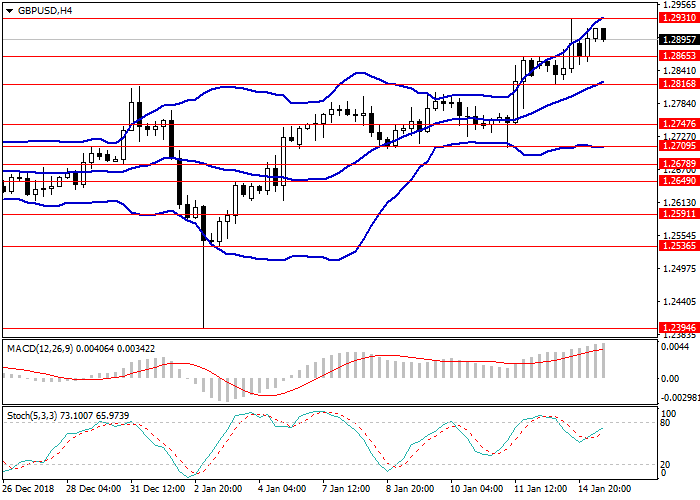 On H4 chart the instrument is growing along the upper border of Bollinger Bands, and the price range is widened. MACD histogram is in the positive area keeping a signal for the opening of long positions. Resistance levels: 1.2931, 1.2985, 1.3030, 1.3069, 1.3173, 1.3235. Support levels: 1.2865, 1.2816, 1.2747, 1.2709, 1.2678, 1.2649, 1.2591, 1.2536, 1.2394. Long positions may be opened from the level of 1.2935 with target at 1.2985 and stop loss at 1.2900. Short positions may be opened from the level of 1.2815 with target at 1.2750 and stop loss at 1.2850.